In this short post I name some random conclusions I had after the first four months of blogging. I hope this will be helpful for people who are considering starting their own programming blog (which I fully recommend to do!). 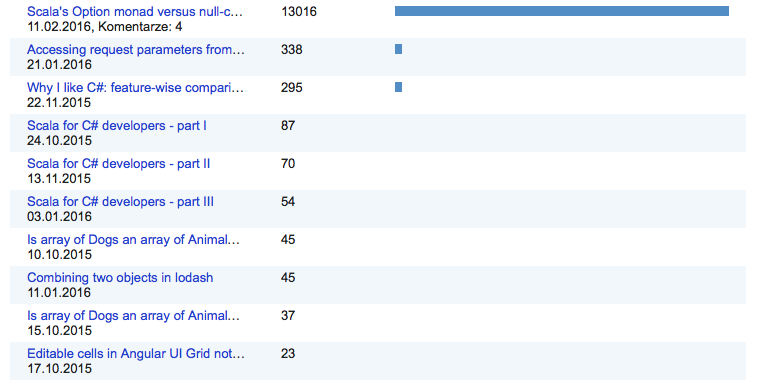 So, most of the views are due to my latest post, Scala’s Option monad versus null-conditional operator in C#. I submit most of my posts to Hacker News and this is also the main source of hits. The conclusion here is that the title of the blog post really matters. I am yet to discover why this particular one caught attention but my suspicion is that with functional programming being a hot topic nowadays might be the reason. 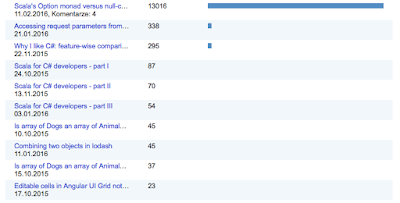 This is much worse than what I aimed for (which is at least one post per week). The primary reason is lack of time since writing a longer piece is at least 2 hours for me. What I plan to do about it is to do more short posts explaining solutions to some interesting problems I encounter at work or while working on side projects (such as Accessing request parameters from inside a Future in Scalatra). I chose Blogger following the advice on one of other programming blogs. So far, I’m not totally happy with it and I kind of regret that I did not choose Wordpress. I once had a blog on Wordpress for a while and what I liked there is that some of the traffic came from other Wordpress users thanks to its Discover and Recommendations features. I thought a similiar thing will happen here with Google+ but it’s not happening at all. Additionally, the choice of free templates is much poorer, the built-in editor is not very convenient and the statistics module is less fancy. Update: I decided to move the blog to Wordpress because of the reasons mentioned above.